This is one of few Charles Reid books that have been reprinted in 2015 and 2016. I love Charles Reid's instructional books and I really welcome all the reprints and hope that more will come. Painting What (You Want) to See is a book that teaches you specifically on how to see and think about your subject before painting. It has lots of helpful tips such as helping you understand values and easily apply them, how to think about colours, focus, composition and the different subtleties of paintings. In short, it covers the why of seeing and painting. Instead of only giving you instructions, it explains clearly and concisely so that you can understand what you're doing too. There are many lovely examples in the book. Some are sketches where Reid use to explain basic concepts before you would develop a more complete painting based on that sketch, and then explain his process. There are also colour swatches like how he would mix shadows, grays, skin tones and other colours, or colour schemes. In addition to the instructions, there are also simple assignments that you can practice on your own. 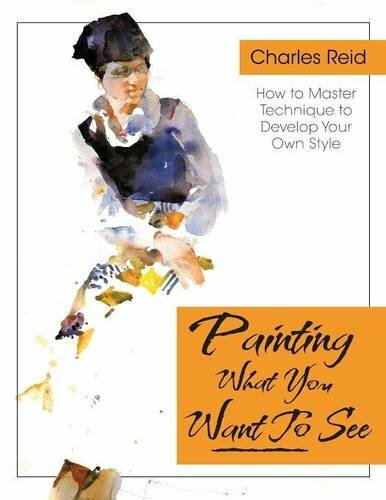 Reid uses oil and watercolour but the knowledge taught in this book can be applied to both because it's about painting in general. Overall, it's an insightful book that I can recommend to beginners and advanced painters. This is a book I see myself going back to read often. Highly recommended.